Ken Shaw Jr. of Ken Shaw Lexus in Toronto says that being competitive on tires and brakes keeps the service department busy. 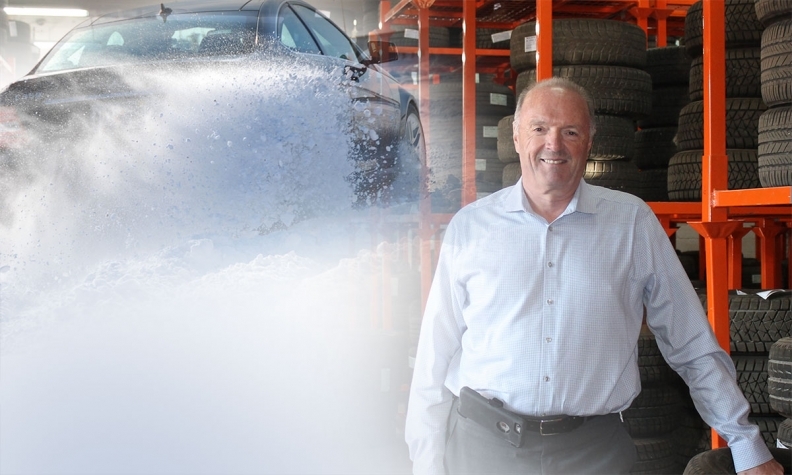 Winter tires are giving Canadian dealers a big advantage over dealers in warmer regions, in the guise of customer retention. “People need a place to store them,” says Ken Shaw Jr., Dealer Principal of Ken Shaw Lexus Toyota in Toronto. “If you’re in a condo there’s a challenge there, and even in a house, you don’t want to bustle tires back and forth. Shaw’s dealership stores more than 3,000 tires on racks in a small warehouse at the back of the store’s 10-acre lot. It charges $100 to store a set of four tires for six months, but that’s not where the value is: it’s in keeping the customer. In Quebec, the use of winter tires from Dec. 15 to March 15 has been mandatory since 2008, but recent changes in regulations across Canada have spurred the use of winter tires in every province. In Ontario, where insurance companies offer a 15 per cent discount for their installation in winter, there’s been an increase in their use from 56 per cent in 2014 to 65 per cent today, according to the Tire and Rubber Association of Canada (TRAC). In B.C., the TRAC says 49 per cent of drivers now use winter tires, compared to 38 per cent in 2014. In Alberta, the usage is 55 per cent compared to 45 per cent two years ago. Manitoba and Saskatchewan have increased 11 per cent to exactly half of all cars, while in Atlantic Canada, 81 per cent of cars are fitted with winter tires, which is up eight per cent from 2014. However, O’Regan says the challenge is that customers wait until tire-swap time to perform other maintenance, creating the potential for busy periods in late fall and spring but quiet stretches in summer and winter. “We have two very significant load periods that are not matched in the other times of the year,” O’Regan says. “It makes it more challenging to look at staffing and hours, trying to make sure we keep our wait times for appointments low, and that you don’t start to see defection into the aftermarket. Changing four tires already on wheels is about a 30-minute job, while tires off the wheels takes four times as long. It’s not just the legislation or incentives that has boosted the use of winter tires, it’s the overall public education about their safety, says Lyssa da Costa, national operations manager for Tire Hotel. try and will deliver them to participating dealers within a day of being requested, same-day if there’s a rush.